Owners: Tony and Marda Vasconcellos have originally established the Dance Junxion. Called “the Dance Warehouse” in 2007 at the time – they envisioned this most amazing dance venue. In 2006 they sold their dream studio to take a break with the birth of their only child Carina, and purchased the dream back in 2012 when she turned 6! Here at The Dance Junxion, we have a variety of offerings available to you. · Venue hire from kiddies parties to corporate functions. We offer both adult and teen classes to singles and couples for all levels of expertise between 13h00-22h00 Monday to Friday. teach both American and International Competitive styles. We can help raise you to national and international dance level standards. Some of our International Open to the World Championships include: Paris, France (2017) and Florida ,USA (2016). we will be returning in June. Click on a tab to view or download the schedule. 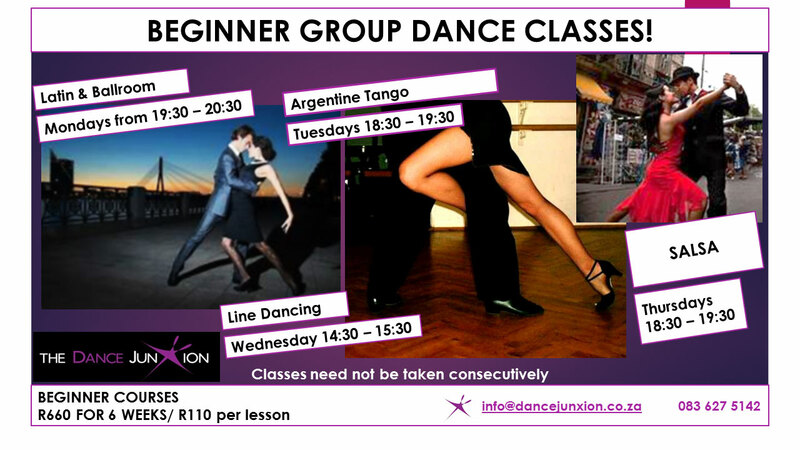 Specialising in Ballroom and Latin, The Dance JunXion will introduce you to and develop your dance skills in this wonderful world of dance that has captivated the global community. We also teach other social dances such as the Mambo, Salsa, Merengue, West Coast Swing, Bolero, East Coast Swing, etc. R660 for course (6 x 1hour group lessons) or join us for a once off R110 per class.